The Netherlands POBOX Closing down end 2018! The above picture is the building of Radio Kootwijk. In 1918, at the end of World War I, there was a need to start wireless communications between Holland and Indië (now Indonesia, at that time part of the Netherlands). Due to the world war, the Netherlands had experienced extreme difficulties maintaining telegraph (line) communications to Indië. After some successful tests with a Telefunken long wave alternating-current generator (alternator) in Nauen (Germany), which were heard in Indië, the Dutch PTT (Rijksdienst der Posterijen en Telegrafie) ordered this 400 KW transmitter at Telefunken. 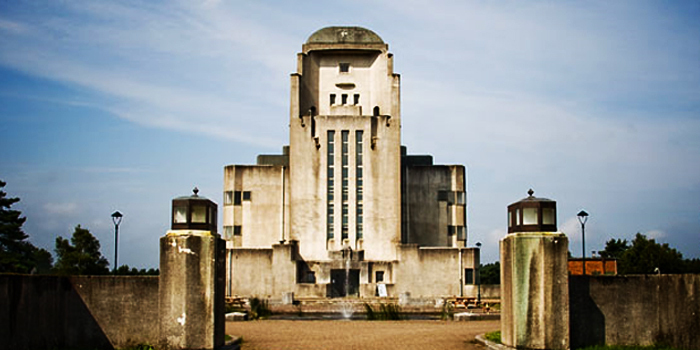 The main transmitter building, were the alternator had to be placed, the first concrete building in the Netherlands designed by J.M. Luthmann, was finished in 1921. The 6 antenna masts (210 meter high) were completed in November 1920. The first (tuning) transmission was made in November 1922 using the call sign PCG and on 18th of January 1923 the first radio contact with Indië was made. On 5th may 1923 Kootwijk started its official service, in the beginning without speed regulation (chirpy signal? ), which was implemented in October 1925. Shortly after 1925, the importance of the VLF machine became less, in favor of the smaller and cheaper lower power short wave tube transmitters also located in Kootwijk. Developments in radio engineering went very rapid; also in 1925 the first short wave telephone conversation between Kootwijk and Indi� took place. It was the longest direct telephone link ever made and it found its place in the World Book of Records. The following years developments leaded to the first single sideband transmissions in the world in 1930 and later multi channel transmissions via a singe transmitter (multi ssb telephone channels plus telex). The Dutch PTT, operator of Kootwijk, had a leading role in developments in Radio Telecommunications. This leaded to an increasing HF network, which an increasing number of countries used. Kootwijk became more and more an important center for world radio communication. All transmitters and receivers were designed and produced by PTT's own laboratory. This all ended in 1940 when Germany occupied Holland and used Kootwijk Radio for their own purposes. After the war in 1945, Kootwijk was severely damaged by the retracting Germans. They demolished all equipment including the old VLF alternator transmitter, which they had used during the war for communication with the German submarines, and all antennas including the 6 more then 200-meter high VLF towers. Only a 3KW short-wave transmitter, made before the war and stored away safely when the Germans occupied Kootwijk, survived. With this and a 40KW transmitter made from survived parts from demolished transmitters, communication started right away after the Germans left. All effort was made to rebuild Kootwijk again and shortly after 1945 found its role again in communication with Indi�, the Dutch possessions in mid-America (Surinam and the Netherlands Antilles) and of course the rest of the world, as most of the under seas telephone cables were out of order. The independence of Indi� in 1950, then Indonesia, changed a lot for Kootwijk. Traffic decreased strongly and in 1960, when the diplomatic relations between the Netherlands and Indonesia were broken, went to zero. This lasted till 1964 when the circuit Amsterdam-Bandung started again. This was not of much help because at the same time the cost of communicating through under sea cables strongly decreased because of newer techniques. When telecommunication satellites came available for commercial service (1978 intelsat IV B), the role for Kootwijk left was only mobile communication (ships and planes).